Lively, topical, and accessible, this text is written integrating culture early and often to allow all students to grasp difficult conceptual material. The inclusion of numerous interesting and diverse examples of the intersection of business and culture motivates students to read on and learn. International Business: The Challenges of Globalization is the fastest growing international business book available today. It presents international business in a comprehensive, yet concise framework. Recent, real-world examples and engaging feature boxes really do bring the concepts of international business to life for readers. User feedback reveals that the reason this book is so popular is that it offers a fresh approach to international business that responds to the readers' requests and needs. A main goal in this third edition is to continue the progress made in the previous two—delivering the most readable, current, and concise international business book on the market. A must-read for anyone involved in International Business. As a team, John Wild, Kenneth Wild, and Jerry Han provide a blend of skills uniquely suited to writing an international business textbook. They combine award-winning teaching and research with a global view of business gained through years of living and working in cultures around the world. Together, they make the topic of international business practical, accessible, and enjoyable. John J. Wild is the Robert and Monica Beyer Distinguished Professor of Business at the University of Wisconsin at Madison. He previously held appointments at the University of Manchester in England and Michigan State University. He received his B.B.A., M.S., and Ph.D. from the University of Wisconsin at Madison. Teaching business courses at both the undergraduate and graduate levels, Professor Wild has received several teaching honors, including the Mabel W. Chipman Excellence-in-Teaching Award, the Teaching Excellence Award from the 2003 graduation class, and the Beta Alpha Psi Excellence in Teaching Award. He is a prior recipient of national research fellowships from KPMG Peat Marwick and the Ernst and Young Foundation. Professor Wild is also a frequent speaker at universities and at national and international conferences. The author of more than 50 publications, in addition to four best-selling textbooks, Professor Wild conducts research on a wide range of topics, including corporate governance, capital markets, and financial analysis and forecasting. He is an active member of several national and international organizations, including the Academy of International Business, and has served as Associate Editor or editorial board member for several prestigious journals. Kenneth L. Wild is affiliated with the University of London, England. He previously taught at the Pennsylvania State University. He received his Ph.D. from the University of Manchester (UMIST) in England and his B.S. and M.S. degrees from the University of Wisconsin. Dr. Wild also undertook postgraduate work at École des Affairs Internationale in Marseilles, France. Having taught students of international business, marketing, and management at both the undergraduate and graduate levels, Dr. Wild is a dedicated contributor to international business education. An active member of several national and international organizations, including the Academy of International Business, he has spoken at major universities and at national and international conferences in Austria, Britain, Kuwait, Portugal, and the United States. Dr. Wild’s research, on a range of international business topics including market entry modes, country risk, and international expansion strategies, have taken him to countries spanning the globe. Additionally, he serves as an Associate Editor of the Middle East Business Review. Jerry C.Y. Han,who passed away September 26, 2002, was Pong Ding Yuen Professor at the University of Hong Kong School of Business, where he was Director of the School’s China Management Programs. He also held appointments at several Chinese Universities, including Beijing University and Renmin University. Professor Han previously held faculty appointments at the University of Buffalo, Hong Kong University of Science and Technology (HKUST), Michigan State University, and National Chung Hsing University. He received his Bachelors degree from National Chung Hsing University, Masters degree from National Chengchi University, and Ph.D. from the University of Buffalo. Professor Han was a highly recognized teacher, known for his commitment and creativity in business education. He was a prior recipient of research fellowships from the government of Hong Kong, HKUST, Price Waterhouse, and National Chengchi University. Dr. Han was actively involved in several national and international organizations, including serving as President of the North American Chinese Association. The author of more than 40 publications on various business topics, including international regulatory and disclosure issues, Professor Han served on the editorial boards of several prestigious journals. He also consulted with international companies and government agencies, as well as taught business courses for international companies across several industries. 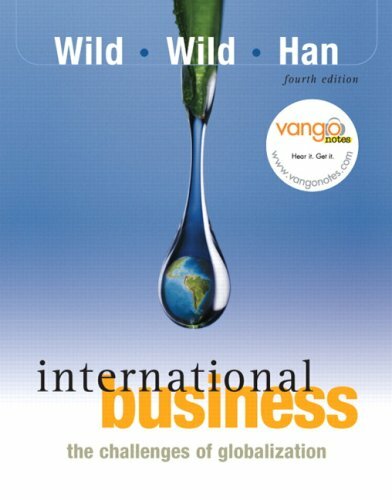 Wild, John J.; Wild, Kenneth L.
4. International Business: The Challenges of Globalization (4th Edition) Wild, John J. and Wild, Kenneth L.